Bob Dylan, I could have gone for you. When I was in my 20’s, I earned 7 university credits on this six week tour of Europe. There were over 50 of us standing before the building in Oslo where the Nobel Prize for Literature is presented. The host looked us over and lo and behold, he pointed at me and said, “Miss, today you will receive the Nobel Prize for Literature. Come everyone, we will go through the exact rituals.” And he gave me his arm. My dreams of becoming a writer were still in incubation but I was so sure this was an omen. He took us through the ceremony as it would have happened. . .I alone, was lost in ecstasy. Make that fantasy. Mr. Dylan, I could have gone for you. I had already gone through the practice run, I would have known what to do. And I wouldn’t have brought you shame by tripping over my gown. Thank you, Wayne Harada, for your generous support of my work. I know Wordsworth and I don’t dance and sing so it’s an honor to appear in your Show Biz Column. Wordsworth wrote this poem to Akiko in his effort to bring her back from her electronically addicted world. That once flowed from your heart. Or have they vanished into thin air? Can they read your poems? This weekend, I attended the Sunrise Ministry Foundation “Journeys to Wellness” seminar. I delivered the keynote address and was honored to be one of the three recipients recognized with the group’s Puaka’ana o ka La (Rise Up!) award. 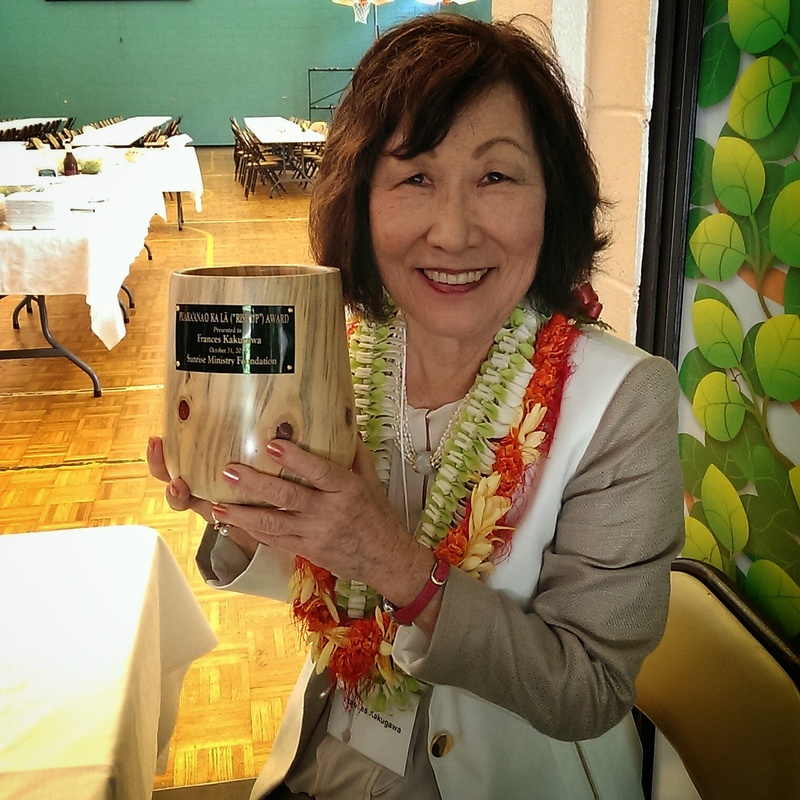 I cherish this award because it brings me back as Hawaii’s child. I thought my umbilical cord to Hawaii was severed when I got my California driver’s license. 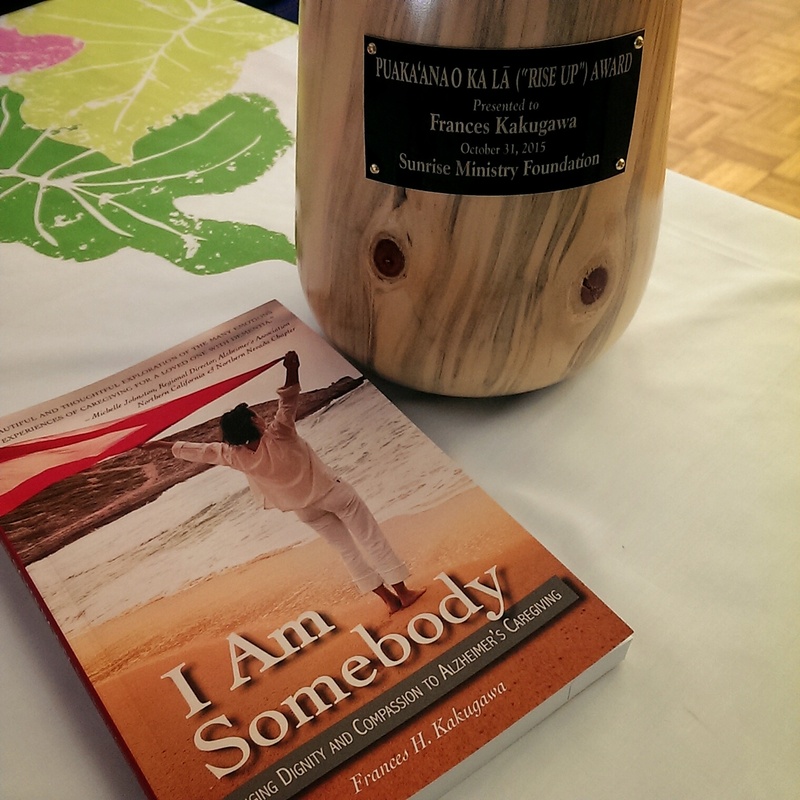 So, thank you, Sunrise Ministry Foundation for this significant gift. Thank you also to Sharlene and Ron Yamauchi and Wally Fukunaga for their assistance in arranging to have my books available for attendees to purchase at the event. 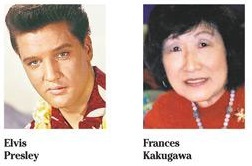 How did Elvis and I get on the same page in Wayne Harada’s column, you ask. Well, I did see Elvis perform in Vegas before he died; he tossed his sweat-drenched handkerchiefs to the audience and I could easily have grabbed one but I didn’t. Now, if he were Bing Crosby, I would have climbed over heads and bodies. This isn’t about handkerchiefs so read on. Disclosure: I’ve been a collector of recorded music for more than 60 years. Imagine walls of shelves and boxes upon boxes on the floor containing vinyl 331⁄3 LPs, 45 rpm singles, cassettes, CDs and videos. To me, this was pure treasure; to my wife, junk that took up a whole bedroom and then some. So clearing out a lifetime of recorded music — whole lotta spending and shaking going on over the decades — has been painful and nostalgic. There were easily 10,000 titles, representing a lifetime of memories and reflecting a soundtrack of my life from the 1950s to the present. Amid the stash, I discovered vintage collectibles and decided to dub a parcel “The <B>Elvis Presley Quartet” to donate as a live-auction bundle for Manoa Valley Theatre’s upcoming Manoa Marquee fundraiser, “Rock ‘n’ Roll is Here to Stay!,” at 5 p.m. May 19 at the Pacific Club. Elvis may not realize it, but proceeds will help MVT continue its tradition of presenting quality stage productions. » Four mint-condition 33 1⁄3 vinyl LPs of Presley’s early best-sellers. » A coffee-table book, “Elvis: A Celebration,” by Mike Evans, DK Publishing. It’s priceless stuff, impossible to merely give away since it represents part of a storied history of listening, collecting, interviewing and reviewing Elvis over the decades. For the right collector of things Elvis, it’s a gold mine.